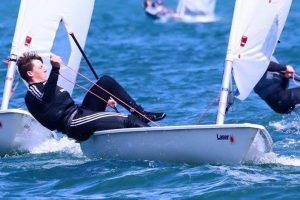 Having completed five of the potential six days racing, the laser radial youth worlds drew to a close last Saturday in Dublin bay. The event was deemed to be a great success and well done to Johnny Durcan on finishing a fantastic seventh place overall and to Ronan Walsh who also qualified for the Gold fleet and finished up in 47th. Other sailors who competed across the silver and bronze fleets and deserve a massive well done after a long and tiring week are Charlie Moloney, Richard Mcginley, Billy Duane, Tara Coveney, Luke McGrath, Eoghan O Regan, Jamie Tingle and Lucy Donworth. We look forward to seeing you all competing at the Irish laser nationals later this month in Galway Bay. Why not “Try Sailing” this August?